There are no more extreme jumps in rallying than those in Finland. And there are no more extreme jumps in Finland than this, a jump that broke multiple bones in one co-driver's back. You can watch the jump here. 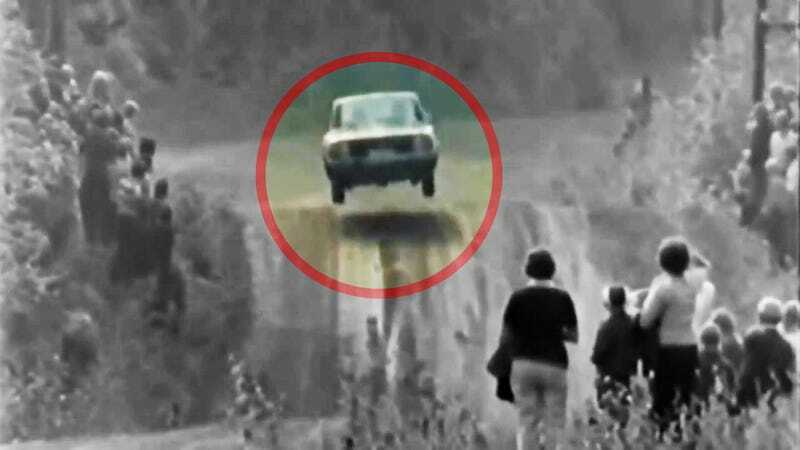 It's the 1973 running of Rally Finland, then known as the 1000 Lakes Rally. The driver is none other than the legendary Finn Hannu Mikkola, who went on to win the world championship in a firebreathing Group B Audi Quattro in 1983. But this would be the last rally for his co-driver, Erkki Rautanen. The landing broke multiple bones in his back, ending his 20-year competitive navigating career with some of rallying's greatest names on the spot. He appeared to be doing alright as of 2009, when he got back in the co-driver's seat for a historic rally as this Finnish article reports. Mikkola was disqualified from the rally after he took Rautanen to the hospital and returned to the finish line without him. Both drivers had to be present to be counted in the final standings.